Today I’m sharing more finds from the house that tossed the heavy sterling silver dish in the fall. These guys exhibited some of the worst judgment I’ve ever seen in my career as a garbage picker – whether that was due to ignorance, total disinterest, or a combination of the two we’ll never know. 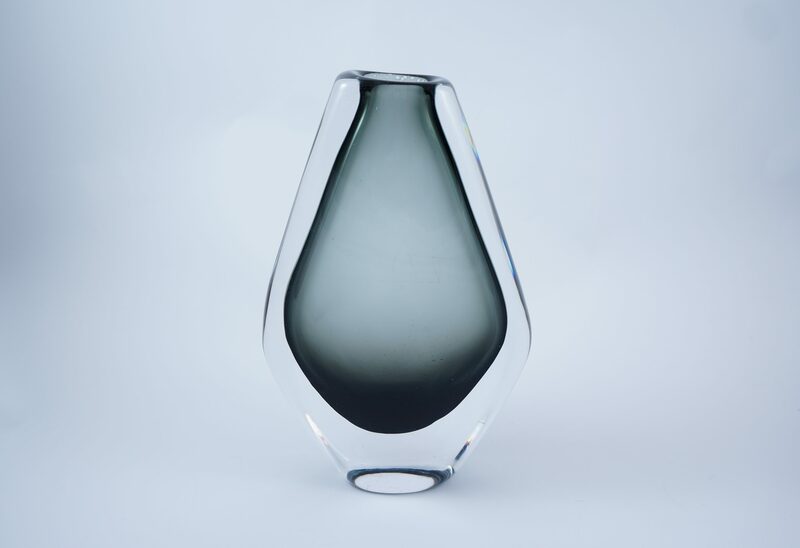 Their treatment of precious metals was notably poor, but they also threw out other quality items like the art glass vase above. 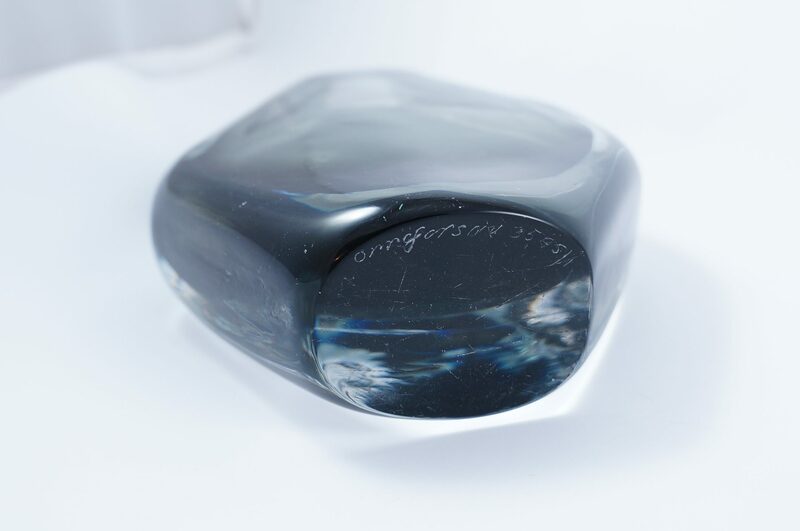 The bottom was signed Orrefors (it took me a while to figure that out), the name of a respected glassworks company based in Sweden. It had no notable defects, and sold a while back for 80$. 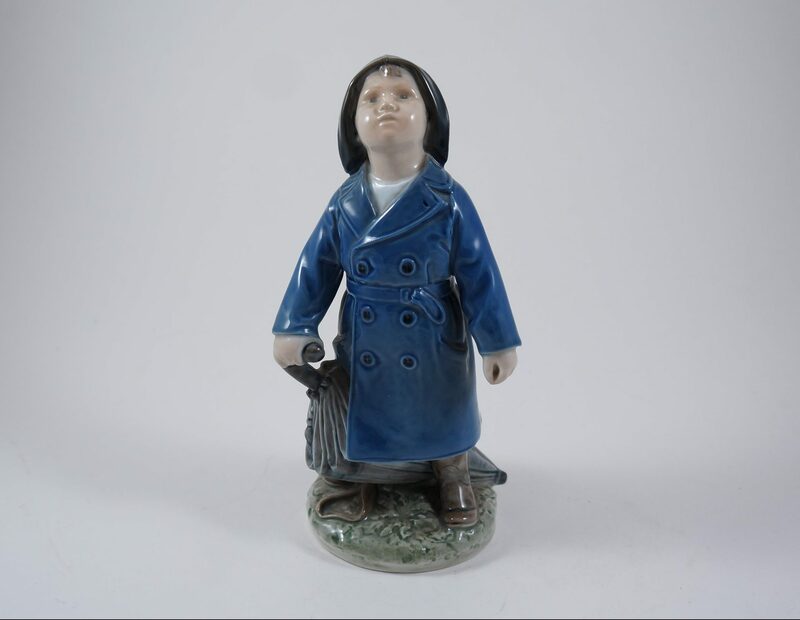 This “boy with umbrella” Royal Copenhagen figurine also showed no signs of damage. It’s about 18cm tall and should sell for around 70$. Some of these things were wrapped in fabric before being tossed. Or perhaps more likely, they were stored wrapped in fabric and then tossed. Either way, this clay sculpture survived its trip to the curb more or less unscathed. 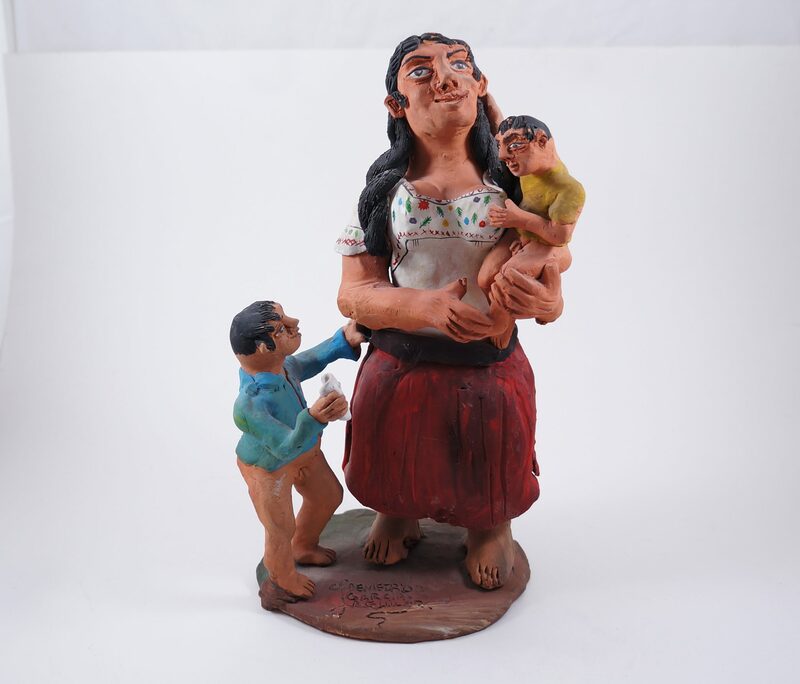 It’s signed by Demetrio Garcia Aguilar, a member of the Aguilar family of Oaxacan potters. It’ll probably sell for around 80$. 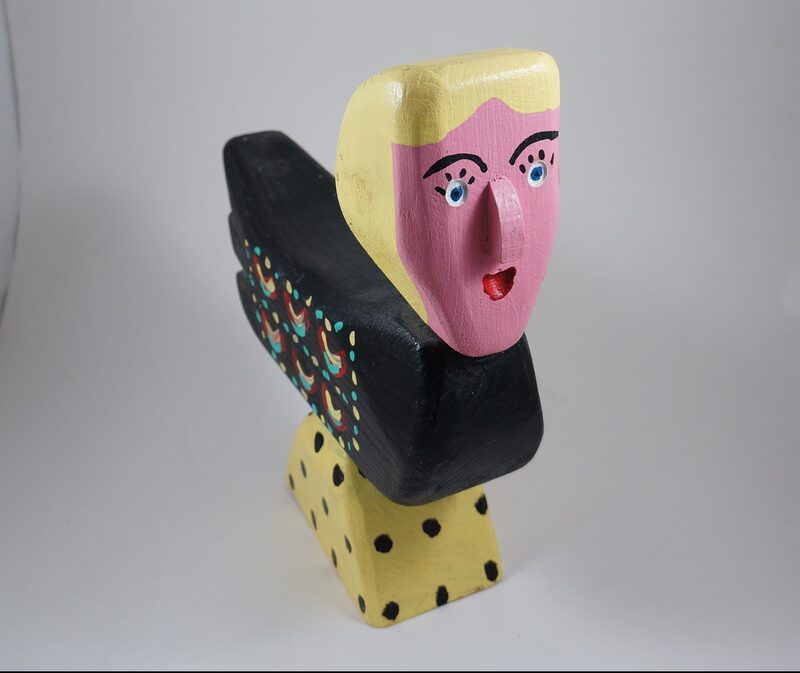 This unusual wood figure was made by J.M. 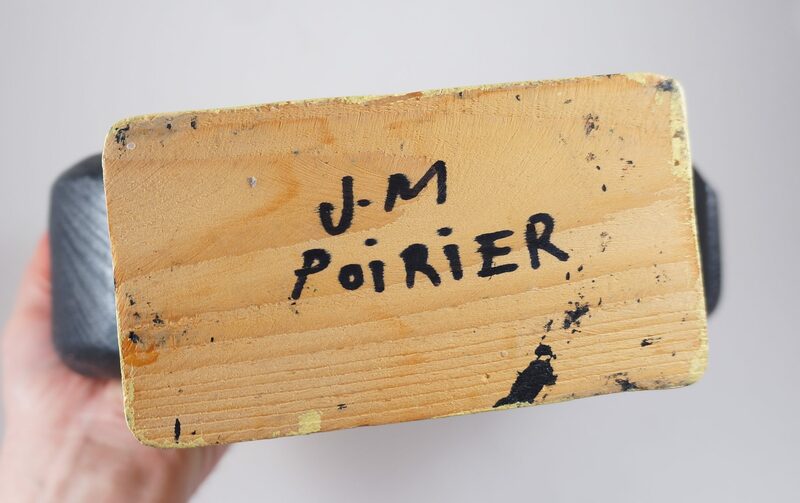 Poirier, a fisherman and folk artist based in Nova Scotia / Îles de la Madeleine. I’m hoping to sell it for around 80$. 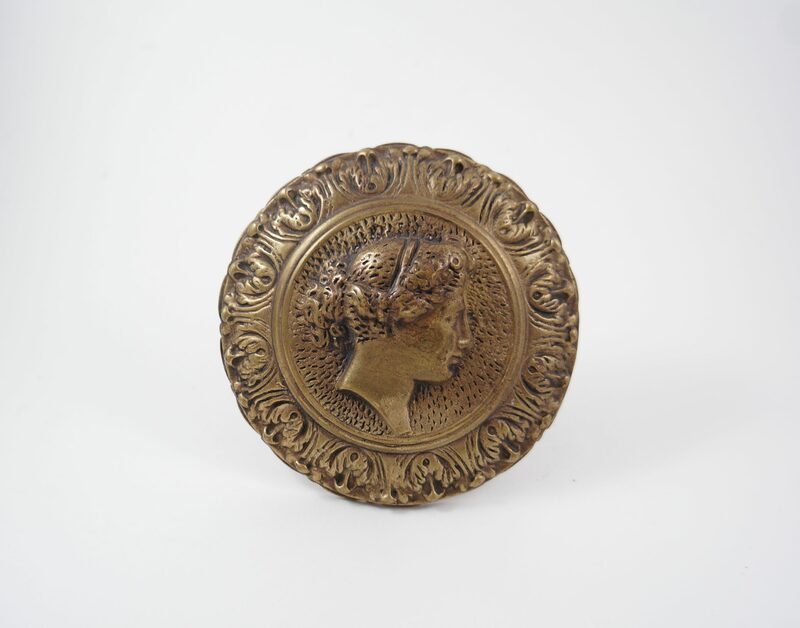 I think this old brass thing is a pull of some kind. It’s pretty big actually, measuring about 12cm in diameter. I’m not sure what to ask for this, so if you have any ideas please share them in the comments! 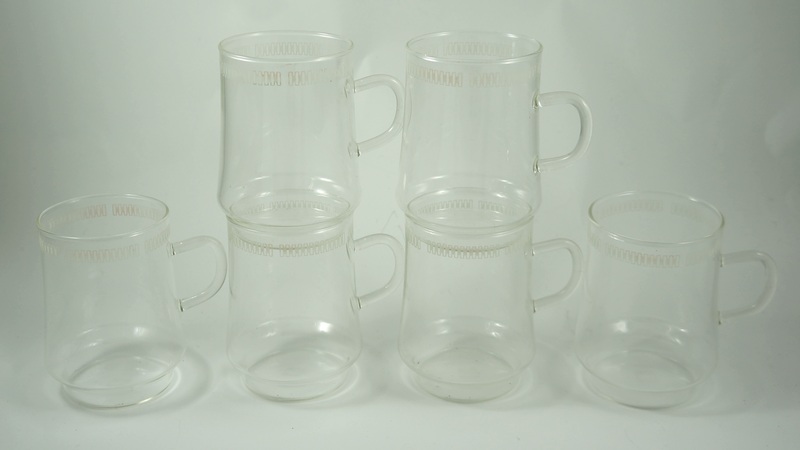 This set of lightweight midcentury etched glass mugs also made it to the curb in surprisingly good condition. They’re marked Schott Mainz Jena Glass on the bottom and would be great for coffee or tea. They’re worth about 10$ each, but I’ll give a customer at this vintage market a good deal when I sell my trash there near the end of the month (April 28-29, save the date!). 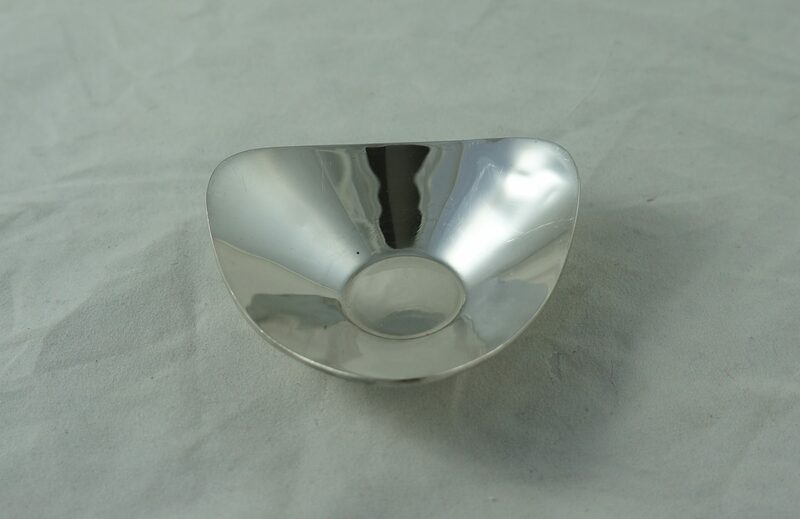 This little silver dish was made in Peru by Camuso. It should sell for around 30$. 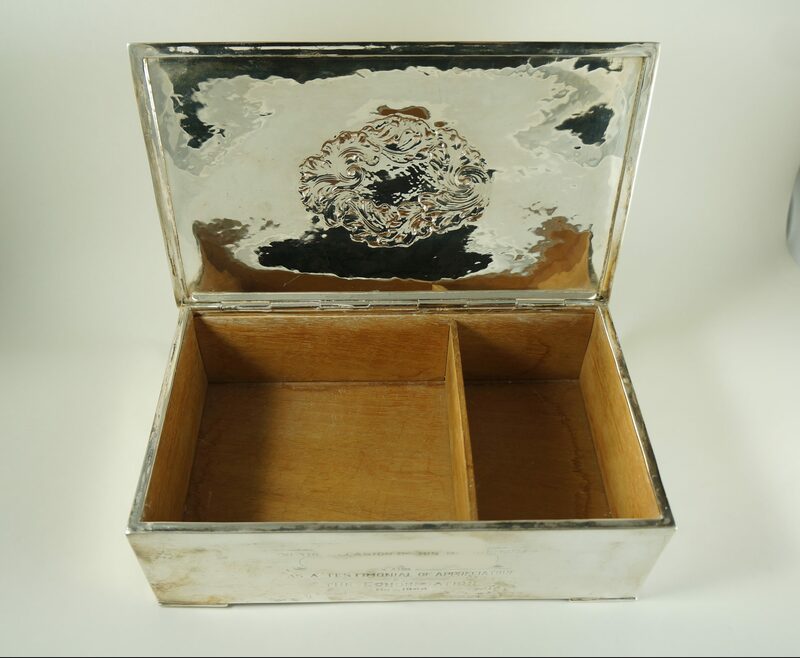 The best silver piece however was this large sterling cigar humidor, which according to the inscription (which I’ve partly censored out) was given as a retirement gift to the President of a local congregation in 1944. 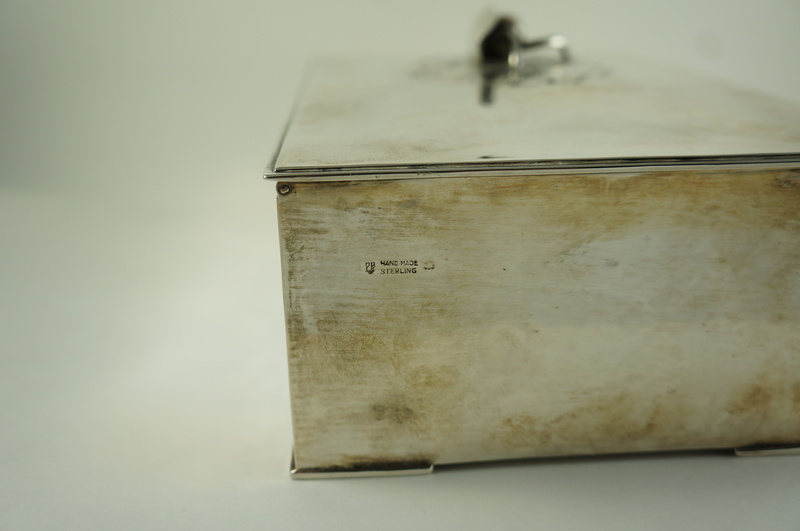 The box weighs about 1.2kg, probably 1.1kg of which is sterling silver. That puts the scrap value of the box at approximately 550$. However, I’ll definitely be able to add a healthy markup to that. 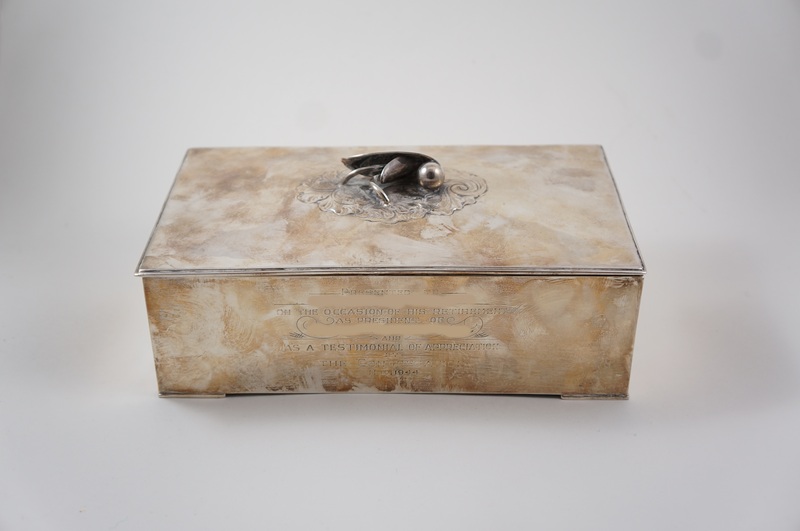 This box was made by Carl Poul Petersen, a Danish-Canadian silversmith who apprenticed under the legendary Georg Jensen. Inspired by this fruit bowl of his that recently sold on eBay for 4450$, I finally got around to listing mine recently for 4000$. I’m probably fishing a bit with that price, as the fruit bowl seems like a bit of an aberration (though his stuff does sell for good money) but hey, it’s better to start way too high than way too low. 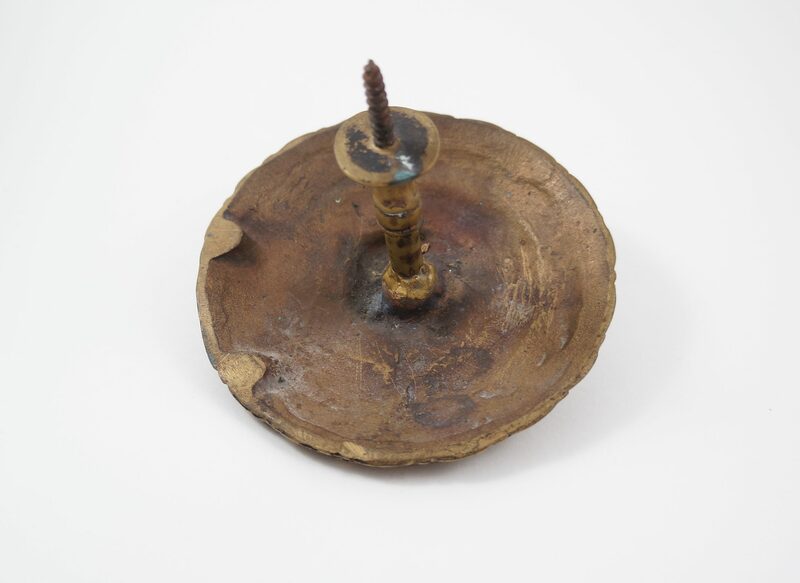 At the very least I expect this to be the first single item that I sell for four figures (those Expo 67 photos from a couple years back sold for 1200$, but that was a group of items; also, the George Nakashima chair sold for over a grand, but after shipping I made only 900$). This is why I called this series “Questionable judgment.” I find sterling, mostly in the form of mediocre jewelry on a regular basis but it’s pretty unusual to find bigger pieces. This place offered me two of them, with a combined scrap value of about 1000$ and the potential for a fair bit more. 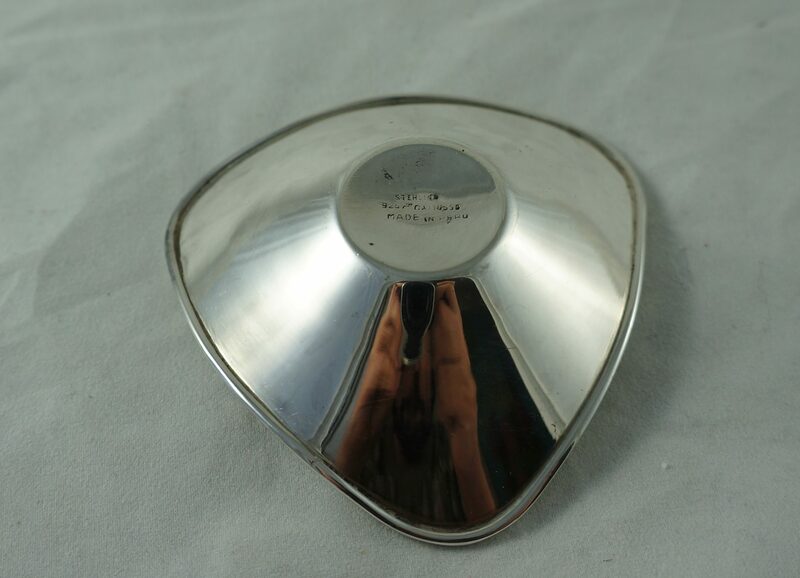 I can understand throwing out silver plated stuff, which has little intrinsic value, but you’ve got to wonder what was going through this person’s head when they were bringing these things to the curb. Part three will feature more quality junk and more precious metals, but that’ll be a little while yet. My “best of 2017” post is almost done so be on the watch for that. Otherwise, I’m swimming in great finds right now and thus have lots to talk about. These days I’m feeling like there’s not enough time in the world to deal with all the stuff I’m salvaging, and I’m trying hard to avoid getting burnt out over it. Last week provided some interesting and unusual finds. I started Sunday night in Cote St-Luc, an area that has been productive for me recently. A spot I had been going to for the last month has now dried up, but this place made sure I didn’t go home empty-handed. From inside the bags I pulled out: some nice silver plate, including a nice footed tray and a menorah; a gold and silver tone serving bowl; and a set of performance springs for a car. The menorah is beautiful but appears to be missing an attachment for a ninth branch – if not for that I bet I could have sold it for a pretty penny. It’s still cool regardless. I also saved a couple pairs of high-heel shoes. One pair was clearly barely worn – only a couple light scuff marks – with a price tag of 325$ still stuck to the bottom. The brand is Spaziomoda of Balogna Italy. I came across this pile the next day in the Mile End. The bags were largely filled with old junk, including a bunch of clothes. I saved a few smaller items, such as a genuinely vintage Pac-Man sticker, a 1950s pennant for Portage La Prairie (Manitoba), and an unusual “Lottowatch.” The watch doesn’t seem to be particularly common or well-known, but there does seems to be a niche group of collectors interested in this kind of thing (this guy even made a video about it!). Apparently in addition to telling time it also generates lottery numbers. I saw one site online selling one like it for 70 British pounds, but the website seems to have gone offline in the last few days. Here’s the link anyways, if it happens to come back up. My watch seems to be in mint condition, perhaps an unappreciated gift from many years ago? I’ll have to get a battery in it, but I expect that it works perfectly fine. On Tuesday morning I did a run to Hampstead and NDG. Hampstead was pretty unexciting, but I did find some great stuff in NDG and nearby. There was an open box at this spot (somewhere near Grand and Monkland) that contained an odd ceramic dish and a chalkware wall-hanging featuring parts of Psalm 23. I noticed that the ceramic dish had a sort of tiki bar feel to it, and knew from past experience that there are collectors passionate about that this kind of stuff. It indeed turned out to be tiki-related – a volcano bowl, to be exact. Apparently you and your friends would fill the bowl with a rum-based mix and drink from it with a straw. Also, to create the “volcano” effect, you could put high-proof rum at the top of the volcano and light it on fire (picture source: Bars go tiki chic). It sounds pretty awesome, actually. As for value, it seems to sell regularly on eBay in the 40-50$ range, not including shipping. Some people have it up for over 400$, but that seems a bit ridiculous and nothing I’ve seen makes me think this is a reasonable price. Later on I came across this spot. There were a lot of bags here, maybe around 15 of the cheap kind that rip easily. There was a lot of cool old stuff here, and while much of it was junky or ruined there were definitely some great things to be found. I searched quickly, knowing the garbage truck was going to come sooner rather than later. I managed to look through most, maybe around 11 of the bags before the truck came and ate the rest. Whoever owned this stuff looked to have saved near everything they ever owned, which always makes for interesting finds. Probably my favorite find from here was this 1948 phone book from Winnepeg. Phone books are the kind of thing that not many people choose to save even for a year, let alone nearly 70(! ), so I think it’s extra special to come across. Really, how many more 1948 Winnepeg phone books do you think still exist, especially in fairly good condition as this one is? It’s full of beautiful old ads, and is a really great blast from the past. Not quite as spectacularly old, but still cool is this 1969 Montreal phone book. I think it’s cool that someone held onto this for 45 years. I think my friend at a local archive will like this! There was a lot of other great stuff, though: a bunch of pastels and other artist materials; a small stamp collection; a bunch of pennies, some of which were stored inside a great old Omega watch box (which might be worth some money even on its own); a silver dime, which was tucked away in a envelope of stamp-related stuff; a 1959 pass for Ontario provincial parks; a hand-painted metal lunch box; seven Red Rose tea collector cards featuring native trees of Canada; a Birks catalogue from the year of the Canada’s centennial (1967); another charga-plate (the precursor of the credit card); and a bunch of magazines, most of which were from the early 1960s (and including a racy 1960s Cosmo “love” issue). I went back the next trash day but nothing was out. Perhaps it’s already done, but I’ll keep an eye on it again this week to see if the house cleaning continues. I went to Mount Royal on Tuesday night and found a few other things of note, including: a vintage designer stapler; two 1960s books about Montreal; a leather book cover; a pair of Vuarnet sunglasses; a sterling silver keychain fob made for Control Data Corporation, one of the original supercomputer manufacturers in the 70s; and a couple of cool wall masks. I focused on other tasks the rest of the week. However, I made several more one-off (ie: where the location was not worth featuring) finds from the week, such as: a hand-made wooden rocking horse in Glenmount (which I left on the curb for others – it was gone within a few hours); a good toolbox in Hampstead (with a couple of decent screwdrivers inside); some watercolour paints, a package of Dead Sea mineral mud, and a couple of jewelry charms in Westmount; and a cool pair of sock stretchers, found while out on errands in Rosemont. 18k gold band: on Etsy for 60$. Found over a year ago in Rosemont. Total: 60$, 5849.65$ since May 18th. Not a great week – if not for my new Etsy listings I would have made nothing at all. I still expect that things will pick up in time for the holidays. I again focused on getting jewelry up on Etsy. If you’re curious, the top eleven listing in my Etsy store are all new.